Prime Minister Narendra Modi on Tuesday said his government is working for the empowerment of Dalits and only industrialization can benefit them. “Our government is your government. We are working for your benefit and empowerment. Financial inclusion is at the core of our focus. 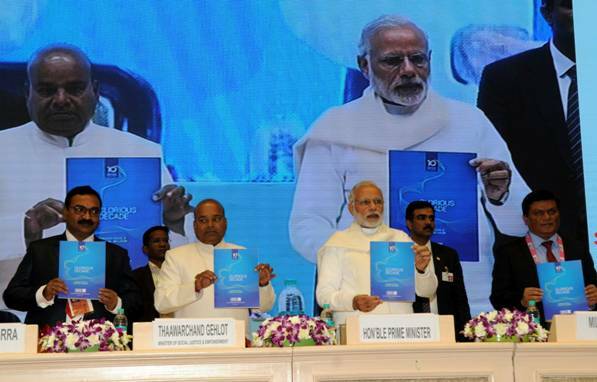 We want to create job-creators, not job-seekers,” Modi said inaugurating the National Conference of Dalit Entrepreneurs at the Dalit Indian Chambers of Commerce and Industry (DICCI) in New Delhi. “We all know Babasaheb Ambedkar was the architect of our constitution, but not many know that he was an accomplished economist too,” he added. He also mentioned about the Venture Capital Fund for First Generation Entrepreneurs. Speaking on the occasion, the prime minister recalled his recent “Mann Ki Baat” programmes, where he exhorted people to talk not just about their rights, but also about duties. He also pointed out that this gathering of Dalit entrepreneurs is one which has not just talked about their duties, but has successfully fulfilled them. The prime minister also presented five business excellence awards to Dalit entrepreneurs on the occasion.